The Muslim community should continue to look for ways to mix with people of other faiths and work together in common spaces, said Minister-in-charge of Muslim Affairs Masagos Zulkifli yesterday. Speaking to reporters after the Aidilfitri prayers in Sultan Mosque, he talked about how younger Muslims are visiting other places of worship, such as churches and temples. "I think this is a coming of age of our community, where we are more confident of interacting with one another, without believing that this interaction will cause problems to ourselves," said Mr Masagos, when asked about the Hari Raya Aidilfitri sermon delivered by Mufti Fatris Bakaram earlier that morning. Dr Fatris spoke of the growing number of Muslims actively engaging in interfaith dialogues and visiting different places of worship. Some call for Muslims to isolate themselves from the vagaries of the world, and from interacting with others as it taints their purity, noted Mr Masagos, who is also Minister for the Environment and Water Resources. "We don't agree with that," he stressed. "We believe that because we are good Muslims, we must contribute to the larger society, whoever they are." All 70 mosques in Singapore conducted Aidilfitri prayers, marking the end of Ramadan and a day of victory after a month of fasting. In his sermon, read by imams in all other mosques here yesterday, Dr Fatris also urged "caution in our intent to express gratitude and nurture spirituality". He called for a strengthening of knowledge and understanding of faith as the "most sensible course of action", adding that there is room for improvement, particularly among the younger generation. President Halimah Yacob and her husband, Mr Mohamed Abdullah Alhabshee, also joined the prayers at Sultan Mosque yesterday. Ramadan and Hari Raya have always held special significance for her, she said, as they remind her of her late mother. "What is important also for me when it comes to Ramadan and Hari Raya, is that it's an opportunity for us to get closer together, both as family members as well as part of the community," she said. It was an occasion for a wefie for these worshippers, who met President Halimah Yacob at Sultan Mosque yesterday morning. 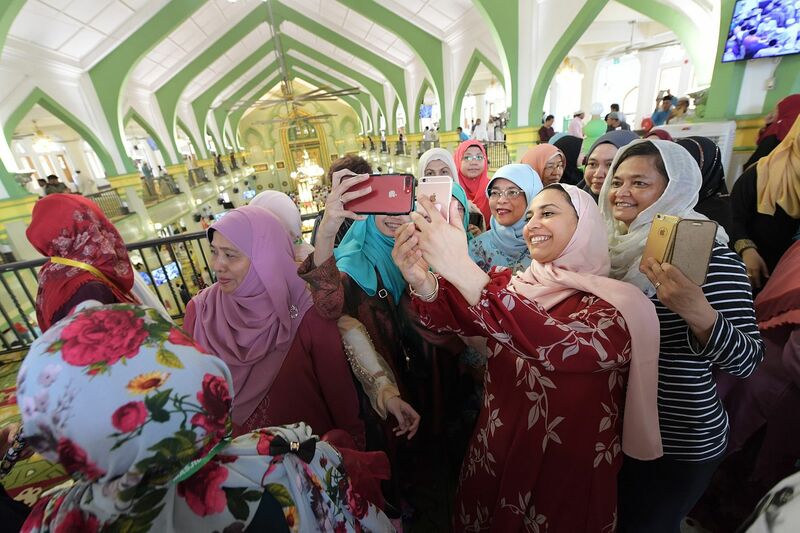 They were among over 5,000 people performing Aidilfitri prayers at the mosque, with President Halimah doing so for the first time as head of state. Minister-in-charge of Muslim Affairs Masagos Zulkifli, who was also present, said after prayers that the Muslim community should continue to look for ways to mix with people of other faiths and work together in common spaces, adding it is "important to increase confidence in our faith as well as in ourselves" as this is being challenged around the world. President Halimah said she hopes the spirit of Ramadan will extend beyond the month.